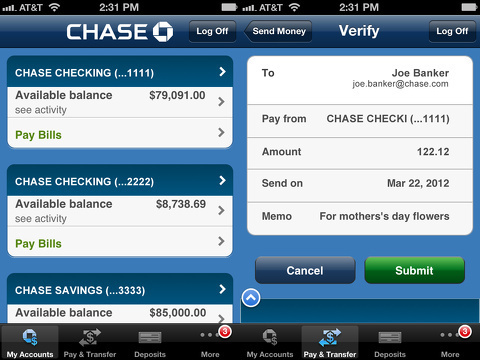 Chase Mobile is the mobile banking app for customers of JP Morgan Chase Bank for iPhone, iPad, and iTouch. Their app offers a number of convenient features and can complete most personal banking tasks. 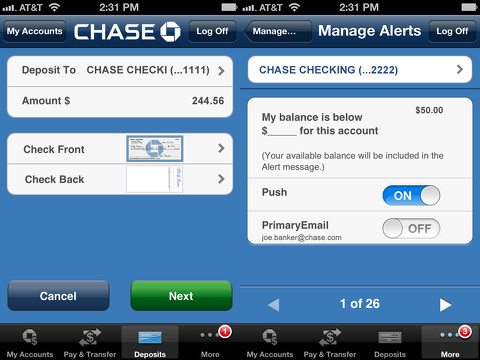 The app allows you to view all your accounts including checking, savings, and credit cards. Your account balance and lists of transaction histories are all viewable, and you can easily transfer money between your accounts. You can also make credit card and bill payments straight from your app, make deposits with Chase QuickDeposit, and make changes to pending transactions. You may have seen Chase touting their Quick Pay service, a fast and easy person-to-person money transferring system between two Chase customers. It takes some quick initial setup with basic information from your friend and within minutes you can approve transfers to each other for free. You can even request money from your more absent minded (or shady) friends who tend to forget they owe you some cash. There are also quite a few customizable alerts and notifications that are available to your account. You can be alerted when your credit falls below a certain amount, when international charges are made, if more than a certain amount is charged to an acount, balance transfers or payments have been posted, when balances are due soon, if your balance falls below a certain amount, and many more. For each option the amount is up to your choosing and you specify whether you’d like to be notified by push, text, or e-mail. I have been using the app for several months now, and it recently saved me from what could have been a much more terrible situation. I had my alerts set to let me know when my checking account was charged for purchases over $100. One day I got a notification for a purchase of $135 that I did not authorize to an establishment I was not familiar with. I was able to quickly contact my bank and the establishment to alert them of the fraud and was able to quickly resolve the situation. On the negative end, I have noticed a pending transaction or two in the past that have taken longer to show up on my mobile app than on my regular online banking account. The Chase Mobile app also comes with a list of contact numbers for various customer service inquiries as well as an ATM/Branch locator to conveniently find locations. It is available for free in the iTunes store. AppSafari review of Chase Mobile was written by Neema Akhtar on November 20th, 2012 and categorized under App Store, Finance. Page viewed 8179 times, 1 so far today. Need help on using these apps? Please read the Help Page. I like this app. It saves a lot of time. The only thing is from time to time when I am trying to deposit a check,for no apparent reason it turns off. I then have to log back in to the app and try again. I have had to several times reinstall the settings to get it to work again. I do not know if this is an iPhone problem or a Chase problem. Either way it gets tiresome. Posted on August 28th, 2015 at 6:39 pm by oliver w.
Chase app for iPhone is so disgusting that it is impossible to use. Every time I want to use it, it will not recognize my device, and will request code from the bank. It is unbelievable frustrating. I reinstalled this app many times, but problem did not go away. Never again even bother to install it.